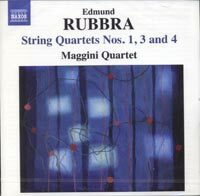 EDMUND RUBBRA (1901-1986): String Quartets No. 1 in F Minor, Op. 35, No. 3, Op. 113 & No. 4, Op. 150. Description: This finishes the Maggini's two-disc cycle of Rubbra's quartets, whose luminous, meditative, calm and optimistic style is quite unlike any other 20th century English composer. So if you didn't buy the out-of-print Conifer set nor the recent Dutton Epoch mid-price box reissue, here's another chance! Maggini Quartet.